Eihän sitä kestä olla enää ainuttakaan kesää tekemättä pyöräkiertuetta! Nyt kun toisen meistä pitää keskittyä lapsenhoitoon, Emilia houkutteli pyöräilemään vakituisen duokumppaninsa Suvi Oskalan. Kare seuraa mukana mekaanikkona ja lapsenhoitajana, kiskoen jo melko painavaksi käynyttä kärryä. Kiertueen idea lähti siitä, että Saariston rengastie on muuten valmis matkailutuote, mutta elävää kulttuuria puuttuu. Niinpä sitä pitää viedä sinne, missä ihmiset kesällä ovat. Polkupyörä valikoitui duon kulkuvälineeksi, koska Emilia Lajunen teki kesällä 2015 koko Suomen laajuisen polkupyöräkiertueen, joka onnistui erinomaisesti ja tavoitti paikalliset yleisöt. Duo Emilia Lajunen & Suvi Oskala esittää kahdella viisikielisellä viululla suomalaista kansanmusiikkia juurevasti mutta moderneina sovituksina. Virtuoottista musiikkia voisi kuvata myös kamarikansanmusiikiksi. Duo kuulostaa soittajamääräänsä suuremmalta, mahtuu pieneen tilaan eikä tanssittavuuttakaan musiikista puutu! Uutuutena duon ohjelmistossa on yhtyeelle sävelletyt tilausteokset, joissa duon ilmaisu laajenee entisestään. We actually did not stop bike touring totally. During the summer 2015 we had a tiny little passenger with us, very well packed then, but now that he is born, touring demands more cargo capacity. We had some concert offers from Benelux countries for summer 2016, but the long travel there would have been the best way to teach our son to hate biking. So we have only made a few domestic gigs. On Helsinki Day in spring we demoed a new urban culture bike tour concept with Happy Guide Helsinki. And last weekend we performed with Panu Varstala’s Trash Heroes project in Porvoo street art festival Strööt. 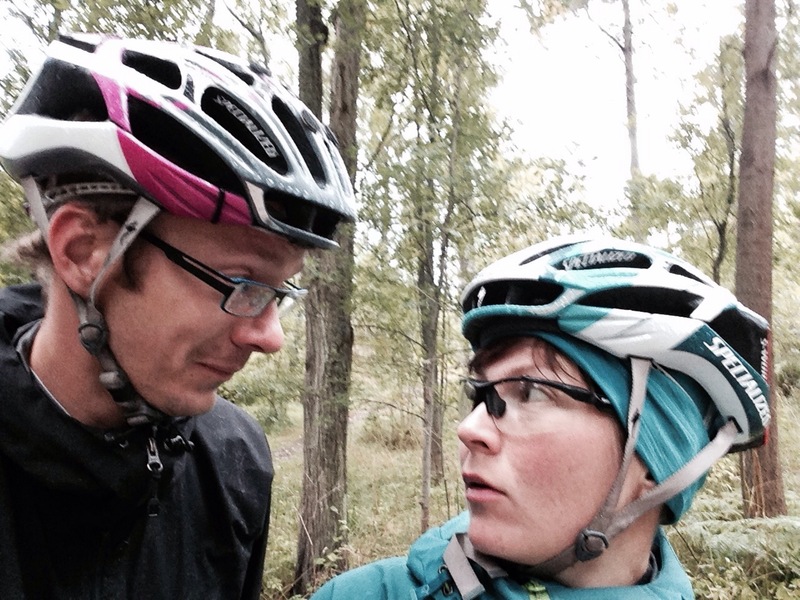 1st of October we will give a short (but musical) presentation in VeloFinland about cycling as a brand tool. And next summer we will come back… with a cargo bike, trailer and stuff. …in reaching our own goals? Had better contact with people than ever before. Experienced our own country and its different areas in a new way, in real-time, real-world. Had a good story, and therefore had good media coverage for our music and message. Had lots of intresting conversations about music and cycling in shops, gas stations, private homes and concerts. Know what it was to be a vagabond musician in Finland hundred years ago – it was tough but great. Yes, we reached our goals. In addition, we are happy with the concerts. Their structure and rhythm was solid. The music was spiced with short and fun speaks about the tour and the music. Emilia made some new music for the tour, and it worked. Kare surprised himself by playing with Emilia in a few (but not too many!) tunes. We had good, different roles on stage, and our relationship and contact intensified the concert experience, we hope. We are still married, which was one of the goals, and not the easiest. It is impossible to say how much we had audience, because the concert places varied so much. But generally concerts were quite full, because of good media coverage and good festival organizers. The most important thing is that the audience was totally different to the normal folk music audience of Helsinki. Finnish folk music got some new friends. We think that the most important concerts were deep in the countryside, outside the cities and big festivals, in local, small cultural spots. There were luckily plenty of those. This tour was not only a set of live concerts, it was also a concept, an idea. That’s why people reached by traditional and social media must also be included in the audience. Kare was responsible for media. From the beginning it was clear that the tour will need two different media strategies. Traditional newspapers, both national and local, would be important for reaching older audience, especially in the countryside, for concert promotion and for the environmental message. Web and social media would be important for brand work and for reaching the audience that would not come to the concerts. For traditional media Kare made three separate press releases. In addition to mass posting he personally contacted persons in media supposedly interested in the tour. That proved to be a success. A two page article in Helsingin Sanomat, the biggest newspaper in Finland, gave a huge media boost in the beginning of the tour. Also provincial and local newspapers followed the tour intensively, by almost twenty articles with interviews, pictures and web versions. We got pretty good coverage in radio and TV, with a nationwide concert broadcast, live interviews, features and news. Kare contacted also music, folk music and bicycle magazines. Their coverage was decent but not excellent. For new media Kare set up web pages with all the necessary information, map and blog. There were over 14000 visitors in total, which is quite all right. The traffic increased after the Helsingin Sanomat article. The blog was active all the time, with proper posts, not just concert ads. Map and concert list were carefully updated in real-time. Kare updated also Emilia’s artist account in Facebook, and there was big increase in likes and good increase in followers. Our Instagram account got over hundred followers without any specific effort. Integrated with web and Facebook, it was the best tool to communicate the feelings on the road. In total, the media coverage of the tour was a success. We rode our bikes all the way. (Well, we took a boat to Porvoo when we were part of a bigger group in Art on Wheels, and we took a ferry to Iniö, because there was no road.) We spared about 700 kg of carbon dioxide emissions. Well, we would have spared the same amount by not eating beef during the tour. That is something to think about, and we thought about it in the blog. But, of course, our main message was that you really can do something to fight the climate change – it is possible to make radical choices in your every day life, and enjoy it. That message got very good reception in concerts and especially in social and traditional media, probably because we told it in a positive way, not by warnings, claims and accusations. With excellent media coverage, we think we did good job saving the world. We noticed that we were pioneers in a bigger movement. The idea of CO2 neutrality is getting popular. For example, symphony orchestra Sinfonia Lahti is trying to be CO2 neutral in a few years. We have made our part in getting that movement going. …in preparing for the future? Due to good media coverage, the tour lifted Emilia’s brand to new level. 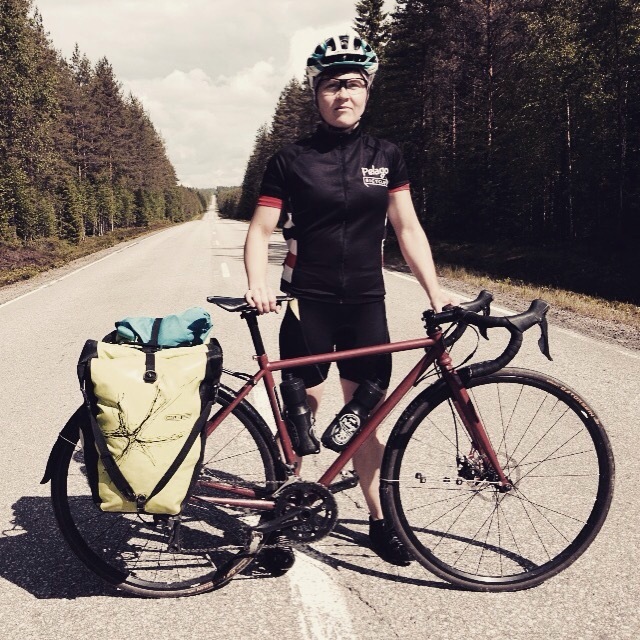 Now she is known all over Finland as ”the fiddler who rides a bike”. A good brand is based on a story, and now she has one. It bodes well for the future. Of course the bike tour in Finland was only a pilot for reaching out to the world. Embassy of The Netherlands already contacted us, and we have some plans and contacts for a tour in Denmark, Northern Germany and Benelux countries. Now we have some proper evidence what it can be. 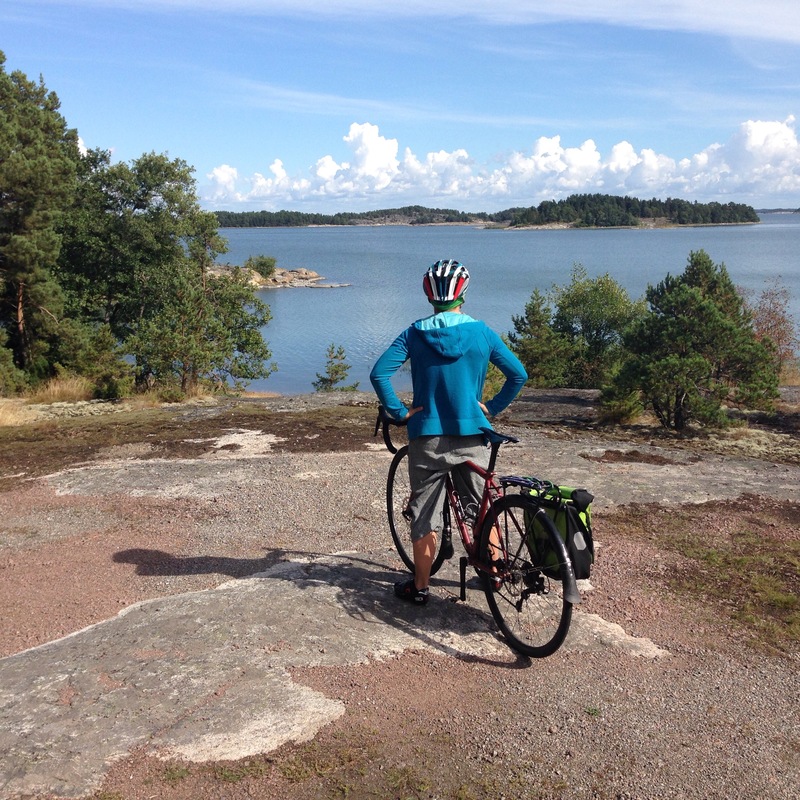 Quite a lot of people from Finland have also contacted us and suggested some bike tour concerts in for example Kaustinen area and Turku Archipelago. Personally we are planning something for the Helsinki area. It may take a few years, but it will happen. 115 followers, 134 pictures & videos. 280 followers, significant increase during the tour. Over 14 000 views, 4300 different visitors. Referred mostly from Facebook, search engines and bicycle related web pages. 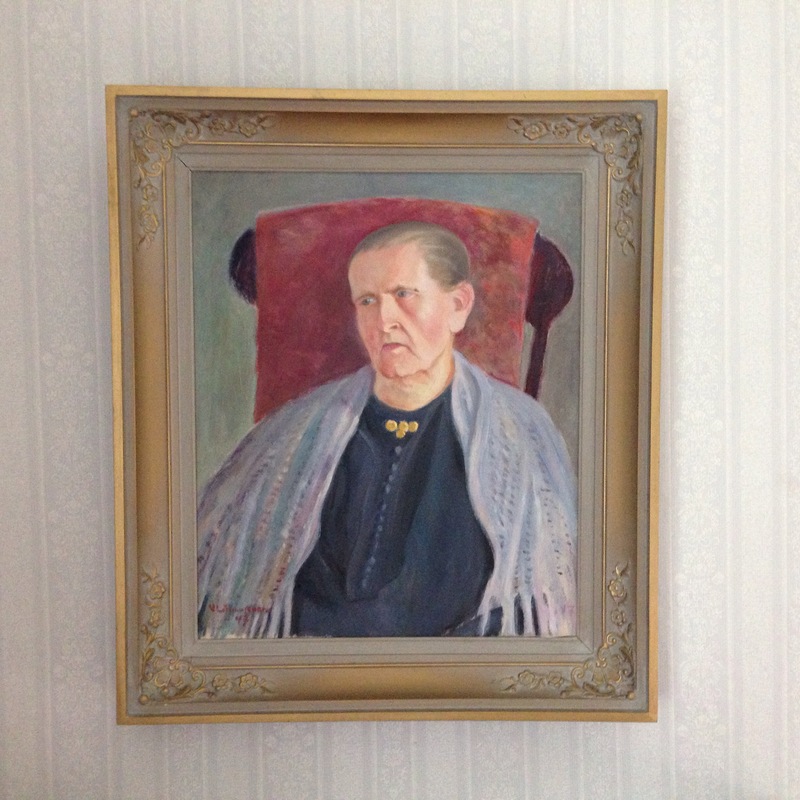 Five video blog posts in http://www.fmq.fi. 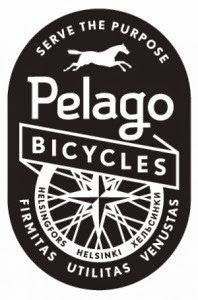 Pelago Bicycles was kind to sponsor us with a bike for our CO2-free folk music tour in Finland. Sponsoring is nice, but it is even more nice to get some honest feedback, so here we go. Our Sibbo was size 50 (XS), model 2014, with Shimano Ultegra 11-speed drivetrain, Avid BB7 disc brakes and Pelago’s own finishing kit. We rode it for about 4200 kilometres, most of that with heavy panniers (25+ kilos). Weather was nasty and tarmac was rough, and we also grinded several hundred kilometers of gravel roads. After all that we think we know how the bike took the beating. Pelago says that ”Sibbo is a lightweight and versatile road bicycle”. That is not correct. Sibbo is not lightweight nor a road bike. It is an excellent, versatile frame built for light touring. For commuting we prefer a straight bar frame. For road we prefer something lighter. But Sibbo’s frame seems to be made for light touring, with mounting points and room for full fenders, rear rack and big tires. And it has got a very tough character. Made of double butted Columbus Thron, Sibbo is a sturdy bike, especially in small size with short main tubes. The frame and fork combination is heavy compared to carbon and alloy competitors, but Sibbo is also very stiff, which is good when riding fast on rough roads with a heavy load. For panniers we used Pelago’s own Commuter steel rack, which was as sturdy as the bike – a very good option. The fork looks nice but as a straight bladed steel fork it is not the most comfortable we have used. But it does not bend when braking, and the bike goes where you point it, even on rough downhills. And you can park the bike however you want and not worry about something damaging your carbon in the middle of nowhere. Steel is a good material for touring, if you calculate the risks. To release the frame’s full potential it might be a good idea to have low rider mounting points in Sibbo’s front fork. We also did not like the horizontal rear dropouts – they add versatility but make it difficult to take off the rear wheel with full fenders. Sibbo’s geometry felt stable, and after many hours in the saddle we appreciated the safe feeling on the bike. Still, it is difficult to review the geometry of such a small size bike, or compare it to a bigger size. Angles, wheelbase and weight distribution change according to the size. But for XS Sibbo, Pelago has done a good job to make such a short bike feel so stable. Sibbo’s paint is of excellent quality. After all the beating there are no chips at all. For starters we made some modifications. Sibbo is specced with an oldfashioned ergo handlebar, which we swapped for a contemporary short reach, shallow drop compact bar. It offered more good hand positions and it made the bike look a lot better. We wonder why Pelago sticks to its old ugly bars. As a design oriented company they should know better. We also swapped the saddle and seatpost. There was nothing wrong with the saddles Pelago offered us – Brooks Cambium and Pelago’s unbranded – but due to long kilometers ahead of us we took our own, trusted saddle, and it happened to be already attached to a lightweight carbon post. In 2014 Sibbo still had 25 mm Schwalbe Durano tires. They are too narrow for Sibbo’s character and even look rather anorectic on it, so we put some 28 mm Gatorskins on. This year Sibbo has got proper 28 mm Duranos – a good move. The wheel’s were Mavic Cross Ones. They stayed true all the way, with no problems in the freewheel or bearings. Good quality, trustworthy touring wheels, enough said. Shimano’s Ultegra 2 x 11-speed shifting was fast and flawless in the rear but only decent in the front. We did not have to adjust the rear deraileur at all, but in front we had some issues with chain dropping and lazy shifting. It got better with adjustments, but the reason may be Sugino’s crankset. It looks nice but is not as refined as Shimano’s Ultegra would be. In 2015 Sibbo will have Shimano 105 gearing, but the Sugino crankset remains. Sibbo’s gearing range (46/36 – 11-28) is wide and steps between gears are small, which is nice for rather flat Finnish roads. We would still advice Pelago to consider 1 x 11 -setup, maybe with 42 in front and 11-36 in back. It would make the bike look sleeker, and the gearing range would be quite enough for Sibbo’s intended use. Remarkably, Shimano Ultegra chain showed no signs of stretch, when measured after the tour. On test tours we used another bike with cantilever brakes. They were scary as hell compared to Sibbo’s excellent disc brakes. We advice anybody intrested in their own safety to invest to discs when touring with a load. Sibbo’s mechanical discs (Avids in 2014, TRP Spyres in 2015) are a good compromise – not as easy to maintain as hydraulic discs, but a lot cheaper and using techology that is possible to repair in the middle of nowhere. 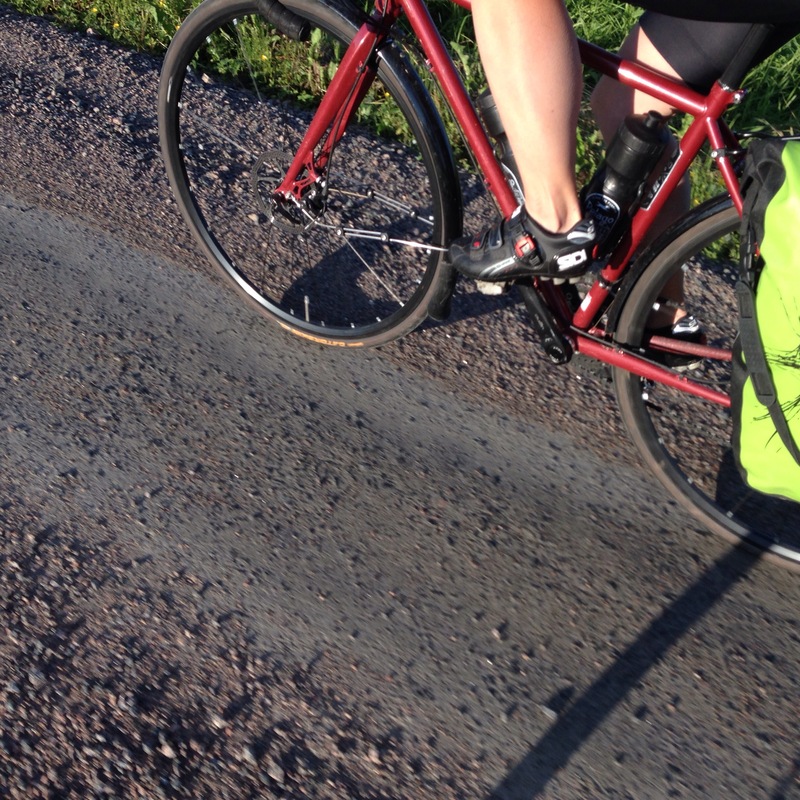 We had no issues with pad wear, even when riding in foul weather on gravel roads. On the tour we had zero techical issues with Sibbo, except a few flat tires caused by snakebites and (our own) worn out tires. That is excellent achievement, considering heavy use and occasional lack of maintenance. To know Sibbo’s full potential we would like to take off fenders and racks and try it on cyclocross, our favored discipline. The stable geometry might be good for high speed curves and rough singletrack, and there is plenty of room for ’cross rubber. We have seen a few Sibbos raced hard in the local ’cross scene. As such, Sibbo is a sturdy little bike with quality parts on it. Not a lightweight race steed, but rather a workhorse that gets anything done with ease. And we have to say that Pelago’s interest in good design has inspired us all the time we have ridden our Sibbo. It looks very good, with a perfect balance of contemporary technology and classic lines. That is us, near home, wondering what we have done, astonished that we are still married, after about 40 concerts and 3500 kilometers. Today at 7 pm we arrived home, after two very rainy, very long days. It will take a few days to sink in. So far we can only say that wow, what a ride. We will probably keep saying that when we are old. Satasoitto festival is not your ordinary festival. It is arranged by a group of warm, fun people, and the concerts were full. Maybe that’s why we got emotional while playing the last tune of the tour. Oh what a ride it has been! But our ride home started in an ordinary way. First sunshine then rain. And we mean cold autumn rain that makes your fingers numb. We evacuated ourselves to Scandic Hotel Forssa. This is not a special place to celebrate the last night of the tour. Not that we could. We are worn out by the kilometres and concerts and nights away from home. We are running on empty. But still smiling. The world famous symphony orchestra Sinfonia Lahti just announced that it wants to go CO2 neutral. Well, seriously, it is encouraging news. 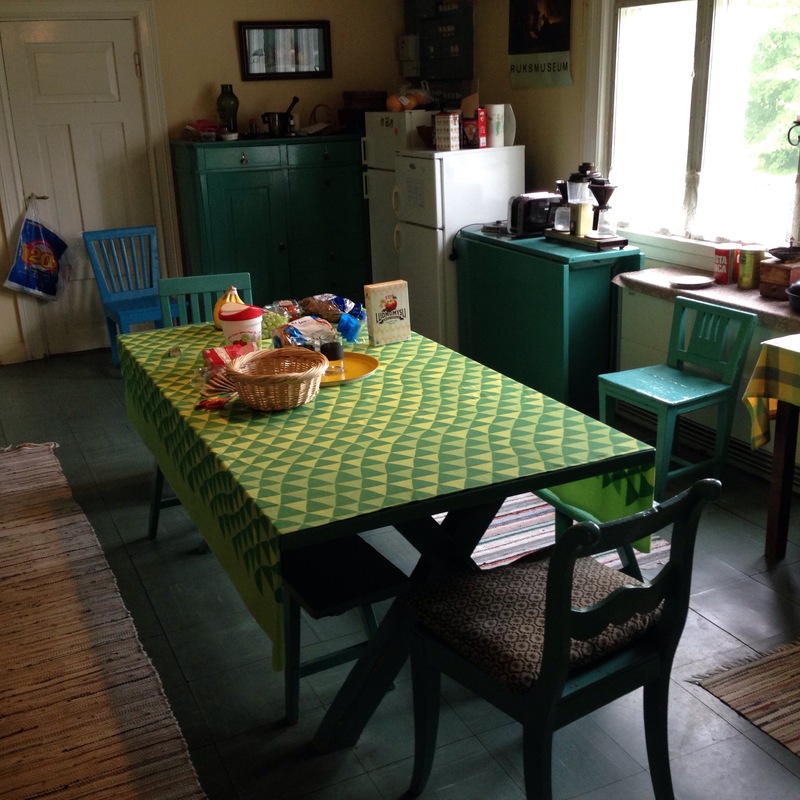 The accommodation on this tour has blown our minds. When you go by car, you end up in stupid hotels that all look the same. When you go by bike, somehow you end up in every kind of strange, beautiful places. All of them have been great, and made us feel welcome. All of them have been experiences that we remember. A tourist with his lonely planet guide will never find anything like them. 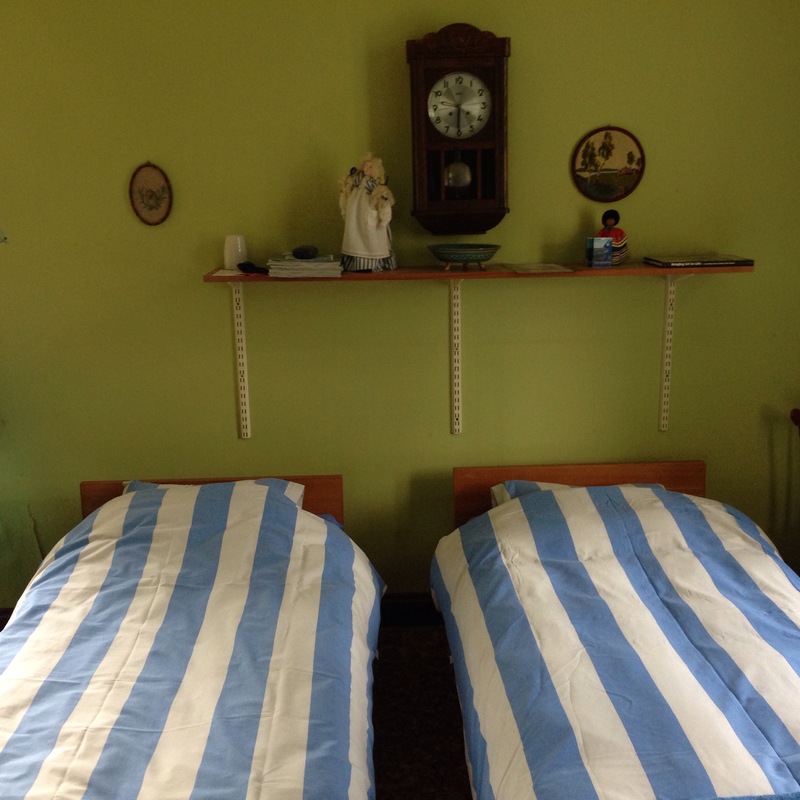 The next few nights we stay in an ancient farm by Kokemäenjoki river. The ”new” main building was built in 1912. 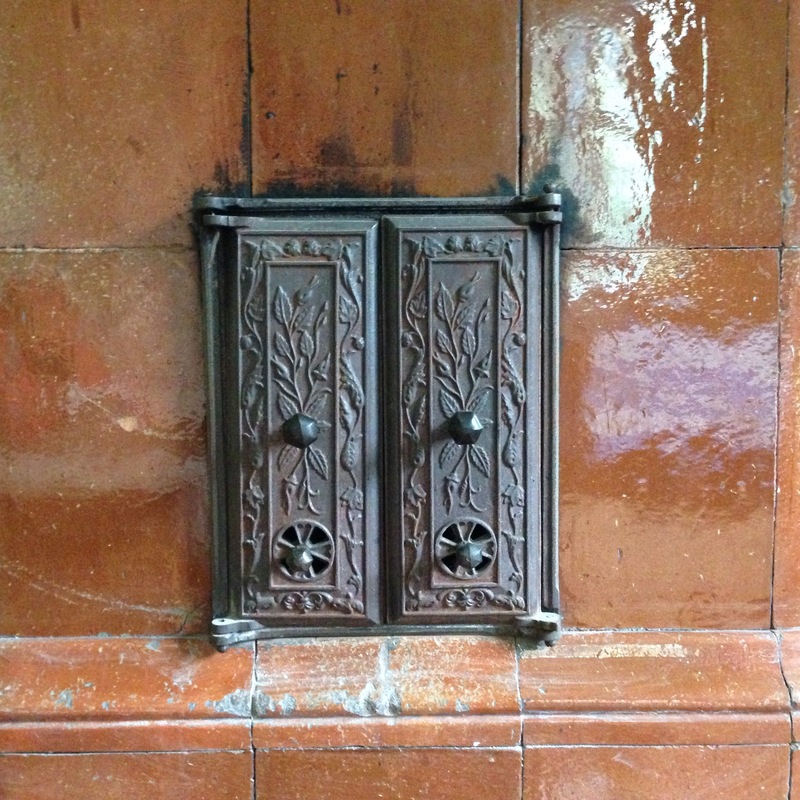 It feels like we are visiting a very old and quite rich relative. But we have all the rooms, apple trees and buildings for ourselves.